This is another article to explore the options in the Central Administration Web Application. In this article, we are going to explain the Manage User Solutions options. When you click on the Manage User solutions Link, you will land on Sandboxed Solution Management page. This page will allow you to manage the user solutions (Sandboxed Solutions). We all know about the Sandboxed solutions, which were introduced in SharePoint 2010, but now are deprecating mode in favor of SharePoint Add-Ons. Most companies still have On-Premise deployment, which are using Sandboxed solutions as an option. In certain situations, SharePoint administrator wants to block a specific Sandbox solution, which is going out of control and causing the farm wide issues. There are many other reasons in which SharePoint admin wants to block Sandbox Solutions for certain amount of time. In Central Admin, as SharePoint Administrator, we can block or unblock a single or multiple Sandbox Solutions. We can also manage the load balancing settings of the Sandbox code executions. SharePoint provides two type of load balancing options. This means the same Server will execute Sandbox Solution, which received the Web request. This solution is not for the production environment due to fact that if high number of Web request, it is received by a single Sandbox Solution. It means the requests for Sandboxed Solutions are routed by the solution affinity. In these options, Sandbox Solutions will pick the Server, which already loads Sandboxed Solution and is run before. This gives us more control on resource management and this option is also recommended. By default, this option is selected. One thing needs to be kept in mind, whether you are using the Local or Remote Load balancing. Sandboxed Solutions Service must be running on all the Servers, where you want execute Sandbox code. 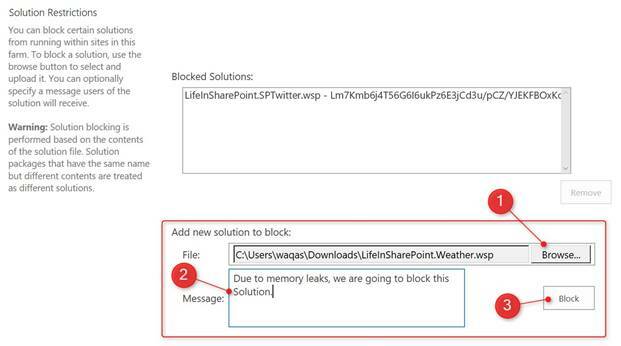 We are going to block the “LifeInSharePoint.Weather” Sandbox Solution. Please follow the steps given below. Login to Central admin with the account member of Farm Administrator group and also local admin on the Server. Go to the Manage User Solutions page. Click Browse button and upload the solutions, which you want to block. Enter the reason, so as to why we want to block the solution. You will see solution is added into the Blocked Solutions lists. We are going to unblock the “LifeInSharePoint.SPTwitter” Sandbox Solution. Please follow the steps given below. In blocked solutions sections, proceed, as shown below. Select the “LifeInSharePoint.SPTwitter” Sandbox Solution. Now, you will see this solution is gone from the blocked list and is allowed in SharePoint Farm. Please follow the steps given below to configure the load balancing options. Login to Central Admin with an account member of Farm Administrator group and also local admin on the Server. 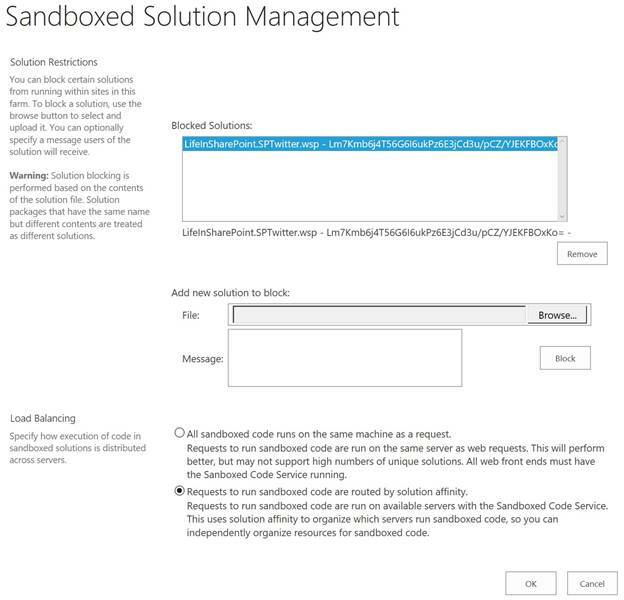 Select either all Sandboxed code, which runs on the same machine as a request or requests to run Sandboxed code are routed by Solution affinity (this option is recommended).